Consulting Engineers South Africa’s (CESA) prestigious CESA Aon Engineering Excellence Awards held at Vodacom World in Midrand on the 12th August this year is a celebration of innovation, quality, outstanding workmanship and professionalism in the industry. CESA is proud to host this annual event, sponsored by Aon South Africa, as a platform to showcase the important role that infrastructure plays in the sustainable development of our country. The Awards focus on consulting engineers and their clients who participate in or initiate projects that promote the advancement of our nation and the people of the continent. In order to showcase the quality, innovation, outstanding workmanship and professionalism of the Consulting Engineering industry Consulting Engineers South Africa (CESA) hosts a prestigious event known as the CESA Aon Engineering Excellence Awards. 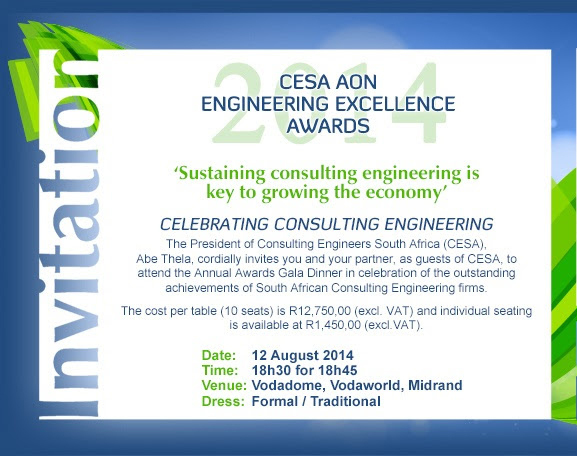 CESA is proud to host this annual event as a platform to showcase the outstanding achievements of its member firms. The Awards focus on consulting engineers and their clients who participate in or initiate projects that promote the advancement of our nation and the people of the continent. The first State of the Nation Address for the fifth term of office of the ANC-led government, which was presented by President Jacob Zuma on June 17, maintained the consistencies of the ruling party on the fundamentals towards economic growth that is meant to eradicate poverty, unemployment and inequalities through the National Development Plan (NDP). The address was delivered soon after the revised sovereign economic rating of the country by Standard & Poor from BBB (-); while Fitch only provided caution by changing its outlook to negative from stable, raising the risk of a downgrade from Fitch. Prominent South African businessman, Saki Macozoma and “A Hill of Fools” author and medical practitioner, Dr Mtutuzeli Nyoka will be addressing the 2nd“Annual Young Professionals (YPs) Sustainability Imbizo” to be held on the 11th to 12th August at the Premier Hotel in Kempton Park. The Sustainability Imbizo is the brain child of Consulting Engineers South Africa’s (CESA) YPs aimed at empowering YPs with the best leadership experience embracing general aspects of leadership, community activism and engineering professionalism. Consulting Engineers South Africa (CESA) welcomes the bold move to lead municipalities back to basics and to put in place institutional mechanisms to enable them to deliver core municipal services as announced by Cooperative Governance and Traditional Affairs Minister (CoGTA), Pravin Gordhan. CoGTA has a responsibility to build a system of local governance, within the three spheres of government as set out in the Constitution. Gordhan added that building such a system is a long term project; however, the ministry is also tasked with dealing with immediate operational difficulties within local government. It's time to get ready for the annual CESA Relay taking place on the 23rd August 2014 at Eagle Waters, Hartbeespoort Dam. 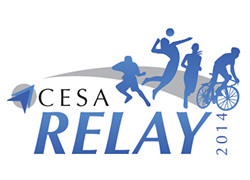 CESA Consultants Relay is a fun sports day where staff from member firms compete against other member teams in fun events – cycling, running, walking, tug-of-war and volleyball. The excitement and enthusiasm generated by this popular event has seen a steady increase in attendance with last year’s event attracting more than 400 teams. Close on 4,000 competitors, family and friends attended last year’s event, held in the pristine surroundings of the Eagle Waters Resort, on the shores of Hartbeespoort Dam. Click here for further information, or to register visit the CESA relay website, www.cesa.co.za/relay. The problem of uneven capacity and varied performance is common at local government level. This year marks the 20th anniversary of democratic government in South Africa, and time has shown through numerous service delivery protests that more still needs to be done to achieve universal access towards provision of basic services to communities. Consulting Engineers South Africa (CESA) envisage that President Jacob Zuma will use the State of the Nation Address (SONA) to emphasize that a rigorous and accelerated implementation of the National Development Plan (NDP) is key to growing the economy of the country and addressing the three triple challenges of unemployment, poverty and inequality. 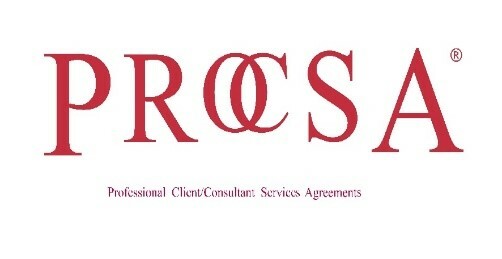 Consulting Engineering South Africa (CESA) is appalled by the pressure put on its members to certify payment for work not done and will not bow to pressure from greedy, unscrupulous and unqualified contractors and corrupt officials. “We are concerned and as an organisation that represents this invaluable profession which is the backbone of quality infrastructure, we cannot accept this despicable behavior and conduct to continue unchallenged,” states CESA CEO Lefadi Makibinyane.